GREENEVILLE - It's a race against time as families fight the state to keep a facility open that houses their loved ones. Next week, a federal judge will decide whether to move forward with the state's plan to close Greene Valley Developmental Center, or GVDC, in Greeneville. Advocates say the proposed closure marks a welcome end to an era of housing people with disabilities in large state-run asylums. 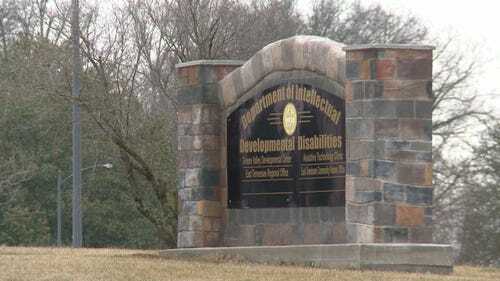 Under the plan, the Department of Intellectual and Developmental Disabilities would close GVDC by June 30, 2016, moving the remaining 96 residents into more community-based settings. 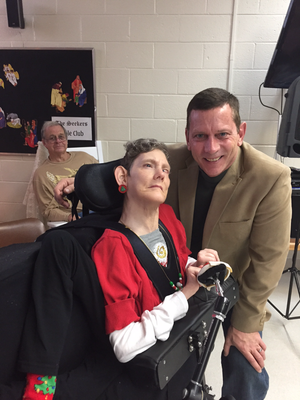 For Brian Bragdon of Greeneville, the closure would mean moving his sister, Denise Bragdon, from one of the only homes she has ever known. According to Bragdon, Denise has been at Greene Valley since 1974. "She's been disabled since birth... Her brain never fully developed so she would be classified among the most severe disabled individuals, probably would be equivalent to a 6-month-old in terms of her mental abilities," Bragdon explained. Doctors told Bragdon's parents that Denise would not live past age 7. She will turn 63 next month. "I do firmly believe that a lot of her longevity is attributed to the fact of the care that she receives at Greene Valley," Bragdon said. The plan to close Greene Valley is part of an overall agreement submitted in federal court last week. It would end a 20-year lawsuit by advocates for people with disabilities, their parents and guardians as well as the federal government against Tennessee over conditions in its institutions for people with intellectual disabilities. "During the course of negotiations, it became clear that the only way to come to agreement with all the parties in the lawsuit was to include the closure of Greene Valley Developmental Center," said Cara Kumari, disabilities department communications director. But Bragdon has been able to keep a close eye on his sister at GVDC. He said he is pleased with the care she receives. "Some of these caregivers have been taking care of my sister for 10, 15, 20 years... They're with them on Christmas Day and every holiday, and they truly love them," he said. If a federal judge approves the closure, Bragdon plans to move his sister to a community-based facility. "This is going to be done very carefully. These transitions are going to be developed by our staff and reviewed by court monitors," Kumari said. The Arc Tennessee has consistently opposed the institutionalization of such patients. It supports closure of Greene Valley, said Carrie Hobbs Guiden, executive director. "However, as with any transition, it must be thoughtfully planned to ensure the health, safety and wellbeing of the people supported. Thoughtful transitions include person-centered plans and a robust private provider system that possesses the expertise to support these individuals in the community," Hobbs Guiden said in a statement to 10News. She said patients who once lived in institutional settings are "thriving" with private providers. According to Kumari, there would be extensive post-placement monitoring after the closure in June 2016 to ensure peoples' needs are being met within their new homes. Kumari also mentioned working with the 600 employees who would need to find new jobs. "The loss of 600 jobs would be very tragic and devastating," said Bragdon, who also serves as an alderman with the city of Greeneville. He went on to say: "We traditionally have had some of the higher unemployment in the state of Tennessee, so certainly this would have an adverse effect. And as an alderman, we are opposed to the closing of Greene Valley for that reason, as well." Costs for keeping Greene Valley open have increased throughout the years. It costs about $420,000 per year for each resident. A hearing on the matter will take place Jan. 21 in Nashville. According to Bragdon, the group Citizens for a Better Tennessee plans to ask the judge to delay the decision. Anita Wadhwani with The Tennessean contributed to this article.